I shop online for almost everything except my groceries. I’m pretty much addicted to online shopping and I’m always looking for coupon codes and ways to save money on my favorite stores. I came across Ebates and got excited. It sounded too good to be true, but I thought I’d try it out anyways. When you sign up you get a credit to your account depending on which option you choose, I chose the $5.00 cash credit. Anytime you go to purchase something online check if the store is on Ebates first. If the store is there click on it and Ebates will open up a tracking link so track your purchases. Anytime you purchase something you will be credited a percentage of the total amount back to your account. The amount will be posted to your account within a few days. If you have a balance in your account every quarter Ebates will send you a cheque or deposit money into your paypal account. My first cheque was only $6.90, but hey that is better than nothing right? You can pick your favorite stores and ebates will even send you emails about promotions and coupon codes. The percentage you get back varies, I’ve seen it be 2% to up to 20%. It changes constantly, they always have promotions with double cash back. You can even earn more money by referring your friends to the site. Ebates gives you $5.00 when you refer a friend. They also always have promotions on to win things such as iPads if you refer a bunch of people. Ebates also introduced a toolbar, now I never miss out on cash back. I used to always forget to go to Ebates before purchasing something, but the toolbar automatically tells me if the website is eligible and I can choose to active cash back. How convenient! Now every time I shop online I go to Ebates. It’s great!! Just about every store is on there. I wish I found this site sooner! If you have any questions about it. or want to share how much cash back you have received just comment below. Don’t miss out on free money sign up to Ebates by clicking here. Are you in Canada? Sign up to Ebates Canada. 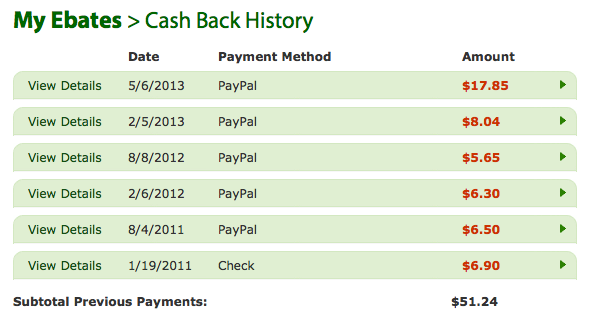 Look at the picture below out how much money I’ve earned from Ebates for doing absolutely nothing!